It makes sharing my DIY adventures all the more fun to have you along! October of 2012 on Thibaut's Tanzania wallpaper! As much as I LOVE it, I’d prefer it in a smaller, less permanent dose…SLAM. another one of my favorite things to include in an entry! :) Check it out here. Clearly our entry had been haunting me on my mind for some time! gave it a couple slight tweaks to get the look of the fabulous, high-end Tanzania wallpaper. 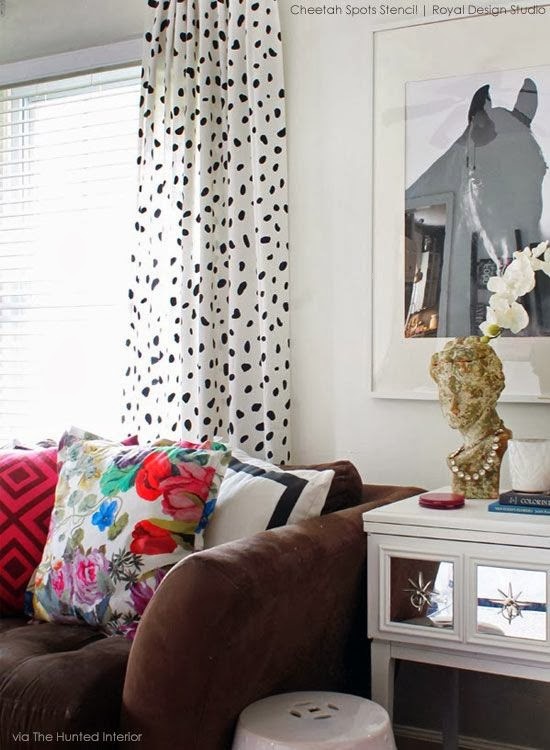 fabric to create spotted drapery panels here. and the spots are more irregular shaped. to give them the irregular look. The tape stayed put for my entire stencil job. I did a sample to illustrate the simple process and differences for you. I used Royal Design Studios Flat Black Stencil Creme and their Stencil Brush. you're all finished go back with the wall paint and do a quick clean up. at a fraction of the cost! they were a pleasure to work with and I highly recommend using their company! Pam, I think the foyer is terrific! It flows well into the other rooms, but it has a nice punch. I'm impressed at how you simply tweaked the stencil & made it look more like the wallpaper...awesome. And the starburst light...icing. It's making me consider stenciling a small powder room. Thanks for the inspiration. I can't get enough of your foyer. And I really want to incorporate that stencil somewhere as well. It looks so good Pam! I made snow leopard fabric to cover a stool, but cannot image doing an enter wall. Well done! thanks for sharing! i love this so much! LOVE the stencil and how you made it work for you! Your imperfection made for perfection, my friend. So fun! Great look! Love how this turned out. I've never thought to modify a stencil before - love what you did with yours! Your foyer is so "you" - stylish and fun! Great idea to make changes to the stencil...the foyer is stunning!! I LOVE it! Just awesome! Fun & beautiful ~ what a lovely combo! I took the Thibaut paper book out on lend about a month ago & was thinking of doing the turquoise paper. But I think black might be better - I wont tire of it as fast. Anyhoo - I just might try stencil now! You saved me a small fortune! Thank you!! **I have gumwood trim - do you think it will still look ok? ** what color white/black did you use? Thank you! You make me want to find a place to stencil that in my house- it looks SO amazing Pam! A perfect Copycat! And so much easier than hanging wallpaper at $$$ a roll! Great job! I find myself having the same foreshadowing in my home! That just means it is meant to be and you will love it in the end! My background color is Navajo White, a creamy warm white and the black is Flat Black Stencil Creme from Royal Design Studios. I think those colors would work with your trim, but it's hard to say without seeing your space, I'd definitely try painting a large sample of Navajo White. You can get sample pots inexpensively at Home Depot, well worth the $3! I'm twitching my nose and hoping some magic happens to put your foyer into my house! I'm thinking it'd look fabulous in my laundry room/entry way. Light fixture and all, thank you! Couldn't love it more! and I love the use of the sunburst mirror! Aren't you clever! It looks so wonderful! You did a lot of work....good job..
OH Pam! I love this! I was beginning to wonder what had happened to you when I decided to clean out my junk folder... imagine my surprise (and great distain..) to discover most of your recent posts. Now I need to set aside a block of time and go back and read them... HOpe you are having a great dqy! Thanks for sharing your tips! I'd love to use that stencil for something. Oh my goodness! I looooooove this. Need opinion I want to do this on a dining room wall as a backdrop for a too serious darkish antique but in metallic gold on cream. What do you think, is that nuts? You are so smart. I love how you tweaked it into perfection. I think there will be a lot of speckled walls soon. The details that went into this stencil is definitely not simple, very intricate and so pretty!!!! you read my mind...I have been thinking of using this stencil in my mud room....I can't believe I missed your reveal...off to check it. And I love your tweaks! Hunted Interior is so fab. I adore her blog. Wow! It looks so great and I love how you tweaked it a bit for the look you wanted. What an entrance! Pam, this is so gorgeous. I love it. I think yours looks better than the original. Keep up the great work and thanks for sharing. Love your blog. I learn so much from you. This is really beautiful, Pam! Wonderful job!! Long story long. :) My husband and I are in the process of buying our first home and I have a picture from Pinterest with that wallpaper on it that I am wanting to paint in our hall bathroom. I was originally going to freehand it, but I stumbled upon the stencil last night. I was wondering if it was worth the price vs. just painting by hand, but you have convinced me. I'm so excited to do it now! Hi Pam!! I know this is a long shot, but I thought "what the heck, why not ask??". 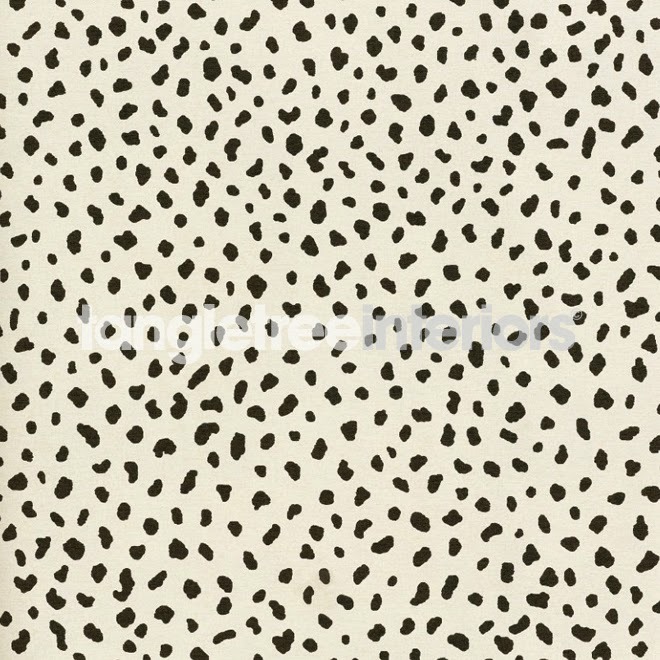 I've been googling a spotted stencil for hours now and came upon the stencil you used at Royal Design. However, I can't afford the $40 price. I'm trying to do my daughters nursery on the tightest budget ever (I'm a SAHM and my husband a pastor). I bought a king size sheet (for $16) for the curtains and cut and hemmed them myself because I couldn't afford $20 a panel. I tried to free hand one panel and my spots look awful!! Like so bad I'm going to have to buy another sheet to make a new panel:( I REALLY want this stencil and even tried to google coupon codes or find them on ebay for cheaper. (Nothing came up) I was curious if you'd be willing to sell your used stencil at a cut price. I totally understand if you want to hang out to it for future use but thought It wouldn't at least hurt to ask. Thanks!! and LOOOOVEEE your wall! I am going to attempt this in my powder bath. I haven't stenciled for probably 20 years! Hi, I was wondering what size stencil brush you used for this? Thanks! remember those tulip bulbs...good news!